This post “Just the Facts, Ma’am” caught my eye as it’s based on the classic cop show Dragnet. 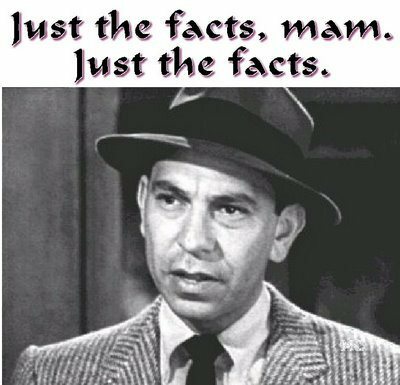 Sergeant Joe Friday’s statement in almost every episode “just the facts Ma’am” is a great metaphor for how to design and write your tactical decision games. Use the facts of the case to write your decision making exercise. Keep our opinions as trainers to ourselves and let the student officers solve problems using their knowhow and experience verses the school solution. After all we want tactical problem solvers not check list followers, don’t we? On the old television program “Dragnet”, the catchphrase of the central character, the fictional Sergeant Joe Friday of the Los Angeles Police Department, was “Just the facts, Ma’am.” The occasion for this admonition was usually the attempt by a witness to insert opinions into her testimony, to embellish her report with things other than the information about “who, what, where, and when” that the detective was looking for. Sergeant Friday’s catchphrase is excellent advice for those who develop, teach, or write materials for decision-forcing cases. The point of decision-forcing cases, after all, is not to give the case developers, case teachers, and the writers of case materials venues for the expression of their opinions. Rather, they serve to give students opportunities to weigh evidence, formulate their own views, and translate those ideas into action. Bruce I. Gudmundsson is a Senior Fellow for the Case Method at Marine Corps University and is the purveyor of The Case Method in Professional Military Education. He is also one hell of an author and has written several military history book, my favorite, Stormtroop Tactics: Innovation in the German Army, 1914-1918. Bruce’s website is and outstanding resource designed and focused on thoughts about the use of the case method, the applicatory method, and military history, with particular reference to their use in staff colleges and other institutions of professional military education. However it is also a great resource for police officers, police trainers and leaders who want to develop themselves and their personnel to a high level of professionalism. One of the areas we in policing lack focus is on our history and the case method is not only a great way to research and learn our history but is also a great way to create and nurture adaptability and problem solving abilities, by not only learning and documenting lessons but in apply the lessons learned. Making our people more effective at what they do is what training and leadership is all about and the case method is a great way of forcing decisions and developing the types of problem solvers we in policing need. Be sure to check out The Case Method in Professional Military Education and the great material there. Also be sure to read the rest of Just the Facts Ma’am. Thanks to Bruce for allowing us to post his great material here to share with police officers.